The heavy-duty NAVIGATOR chassis is built in high-tensile Domex steel ensuring exceptional strength. The chassis is built to endure under the most difficult conditions anywhere in the world. 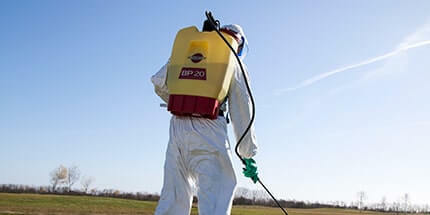 A sprayer with a high centre of gravity would be very dangerous to operate, and therefore, large efforts have been done to ensure the lowest possible centre of gravity for the NAVIGATOR without compromising the clearance under the sprayer. The long drawbar is bolted underneath the frame, providing good driving stability and absorbing up and down forces at high-speed driving. 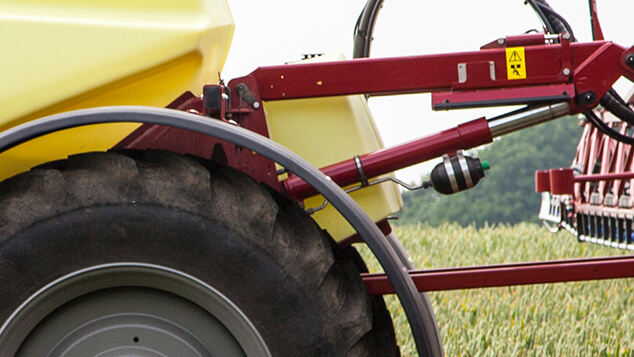 The unique design of axle and frame ensures excellent crop clearance, reducing crop damage to the absolute minimum. No brake rods or steering components are lower than the axle. 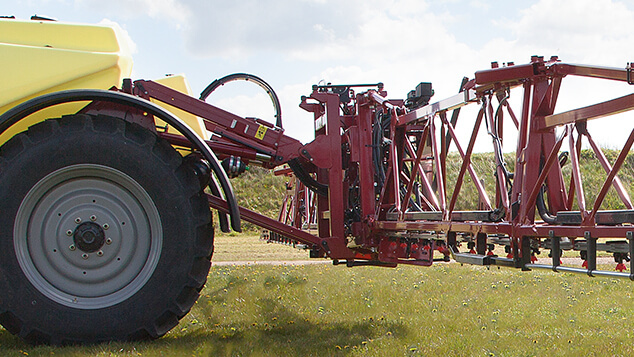 The drawbar connection on the tractor will always be the lowest point on the sprayer, and, in most cases, also the tractor axle is lower than the sprayer chassis. Important features of the NAVIGATOR design are the drawbar being small in width and one line upwards from the linkage to the axle. 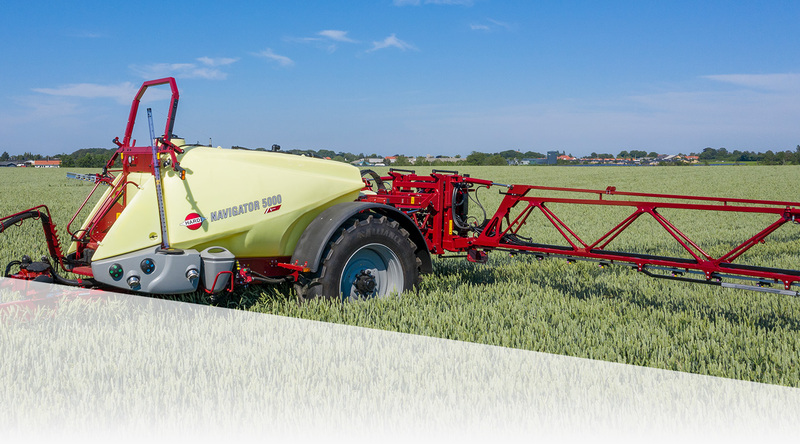 The vital clearance under the sprayer axle is excellent, varying from 70 – 80 cm depending on tyre and wheel set-up. The lid is located in close proximity to the platform, allowing easy inspection of the tank. The design of the tank gives the operator excellent visibility of the sides as well as the bottom of the tank. A traversable footstep is fixed at the drawbar to facilitate access to the platform. The platform is placed as low as possible for easy access. To aid in service accessibility the majority of electronic components and connections are located in a box behind the right front cover. Excellent service access to the fluid system can be gained through the floor plate of the platform. Gauges for monitoring the condition of the suction filter and the pressure gauge are mounted over the platform. This provides excellent visibility from the tractor and good protection from the elements. The NAVIGATOR is also available as a tracked version, where the drawbar is divided in two - a rear part fixed on the frame and a movable front part. 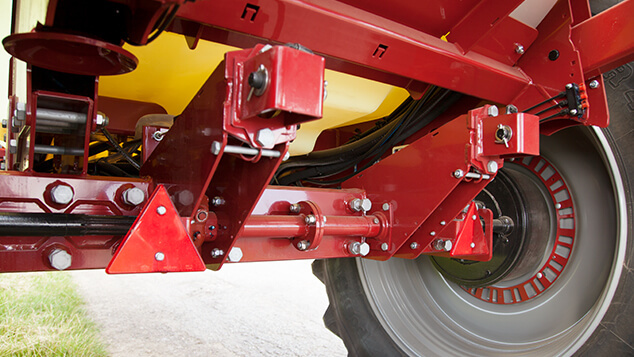 The concept of a rearwards inclined pivot axle ensures the best possible geometry for stability and the hydraulic system. Tests have shown that 2 cylinders on the drawbar provide better driving stability and far smoother turning of the machine due to the higher oil demand and equal displacement. 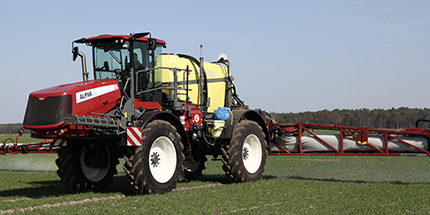 Once the NAVIGATOR IntelliTrack has been calibrated, the operator only needs to attach 2 small chains to the tractor before starting to spray. 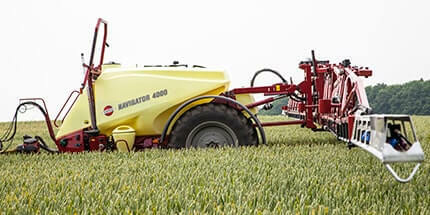 The NAVIGATOR 3000 and 4000 is available with a fixed axle with 1.90 m hub distance, allowing for 1.80 m or 2.0 m track width. The individual track width is obtained by turning the wheels. Adjustable axles are available as an option for all models; they are easily adjusted by loosening the bolts. 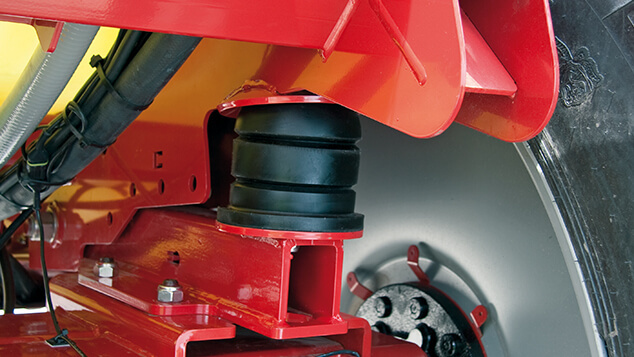 The brake system is designed so that no brake components, like brake arms or cylinders, are lower than the main axle. 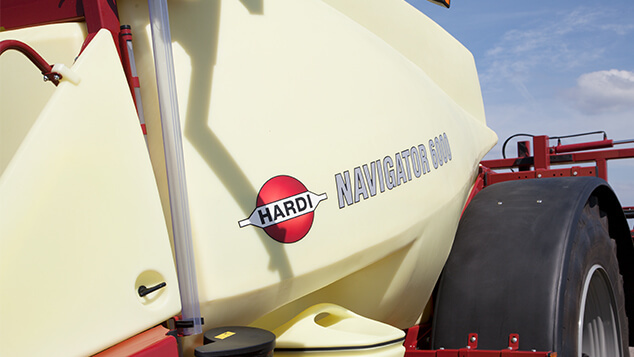 The NAVIGATOR concept allows the farmer to choose whichever brake system he prefers. 5 different options are available. For the 4000-6000 l model, however, a brake must be ordered, leaving only 4 possible choices. Be aware that the road transport laws of the different markets are to be followed. The optional SmoothRide suspension system is incomplex and reliable, requiring little or no service. 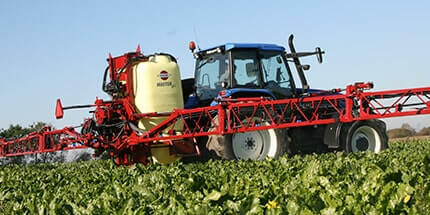 The suspension gives a better ride of the sprayer, resulting in higher capacity as well as comfort. 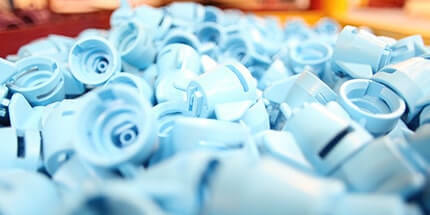 2 polyurethane dampers absorb the movements. The dimensions of the dampers ensure that they do not get over-compressed when the tank is empty, which will make them last longer. During road transport the trailer and consequently the boom will not be pushed so hard. 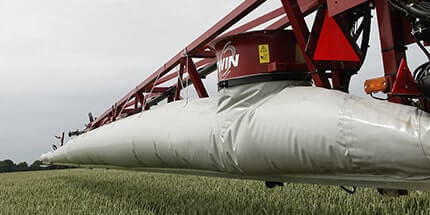 In field conditions the boom suspension will work better so the boom can be run in optimum height over the crop. 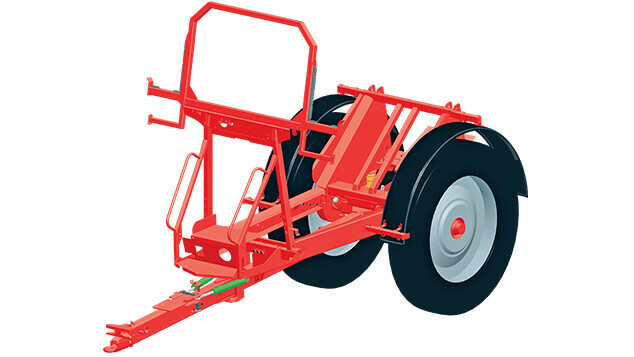 Parallelogram lift systems are standard on modern sprayers. 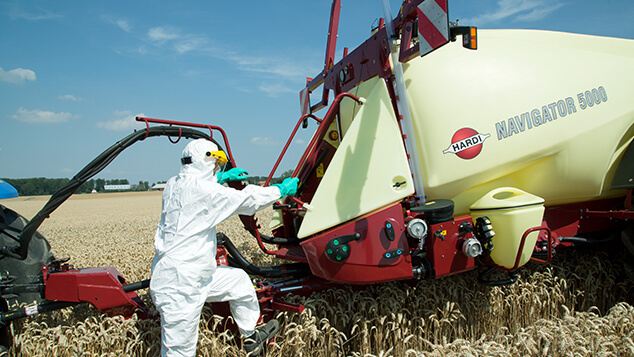 The HARDI ParaLift concept has shown its excellent performance on more than 20,000 trailer sprayers. 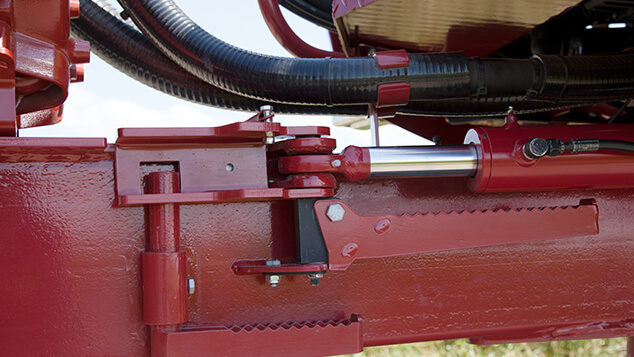 No gliding parts, only horizontal bolts and an automatic mechanical transport lock ensure excellent boom stability with more or less no service. The ParaLift is a push type meaning the cylinder is out when the boom is up. 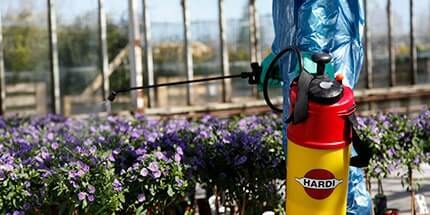 The HARDI ParaLift requires a minimum of service (lubrication, adjustment etc.) compared to traditional H-frame systems. The polyethylene tanks of the NAVIGATOR are produced as one part. They have a very flat surface, no inside walls, and they rest freely in the frame. 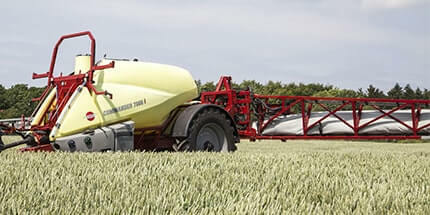 To make the sprayer as stable as possible the tank is wider at the bottom and completely integrated in the frame design. This ensures a low centre of gravity. Liquid is moved forwards as the tank is emptied, thereby maintaining weight on the drawbar. This ensures that the traction on the tractor is maintained, even when going up slopes with an almost empty tank. The optional 500 l RinseTank is the same model as on the COMMANDER models, providing adequate liquid for both inside and outside cleaning. 1" filling from the working zone is standard. The RinseTank is typically the last tank to be emptied, and its position on the rear axle provides additional stability. The level indicator is placed on the left hand side in the working zone, allowing step-by-step cleaning. 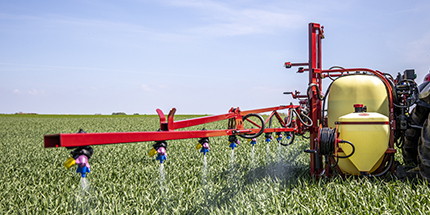 Together with the RinseTank, two rinsing nozzles are delivered as standard.